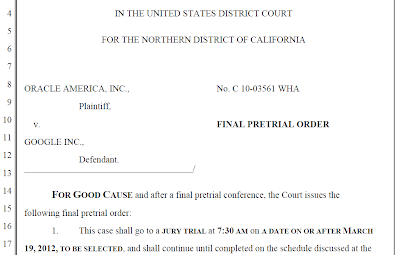 This morning, Judge William Alsup, the federal judge presiding over Oracle's Java-related infringement lawsuit against Google at the United States District Court for the Northern District of California, entered his final pretrial order. The case was originally scheduled to go to trial on October 31 (Halloween), 2011, but it was postponed into this year. Oracle recently urged the court to resolve this matter as soon as possible and would have liked the trial to start, ideally from Oracle's perspective, this month. Google indicated that a trial date in the summer was more realistic. By picking a March date, the decision is a little closer to Oracle's preference, but March 19 is not a definitive date yet. That said, it appears less likely that there would be a huge delay beyond March 19, given that pretty much everything has been put in place or is being finalized with a view to this trial. The first part will deal with copyright infringement liability. The second trial phase will address patent infringement liability. Today's order does not mention or hint at the possibility of a stay of the patent part of the case pending reexaminations of five of Oracle's patents-in-suit by the United States Patent and Trademark Office. At this stage, not even one of Oracle's patents-in-suit has been definitively invalidated (given that any decisions taken so far have been at the level of the USPTO's reexamination department, not its Board of Patent Appeals and Interferences, let alone the Federal Circuit), though there is considerable pressure on four of them. Even though today's order doesn't mention a possible stay, Judge Alsup could still order one before the second trial phase begins. At this stage I believe he has realized that the best chance to get the parties to settle is a reasonably firm trial date and, possibly, a ruling on the copyright part of the case. Once the copyright phase is over, the possibility of a stay of the patent liability part may be on the agenda once again. Phase three will deal with "all remaining issues", particularly with "damages and willfulness". All three parts of the trial will be put before the same jury of 12 persons to be selected. Testimony won't be recorded and witnesses won't appear twice. Testimony will be given once and can then be referenced in subsequent trial phases. After the three trials, Judge Alsup may have to decide (if Google has been found liable for some infringement) on a possible permanent injunction. The order states the following: "Evidence and argument relevant solely to whether a permanent injunction should issue must be saved for a subsequent proceeding, if necessary, after the jury trial." 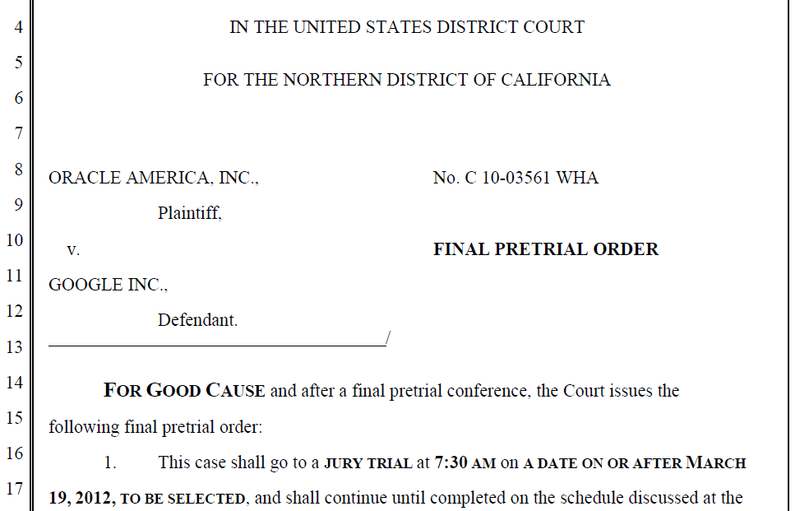 Oracle and Google have seven calendar days to file any objections to this pretrial order, which "must be specific and cite to legal authority". I believe Google is unlikely to object. Oracle previously argued that it is "prejudiced" by a trifurcated trial, but it remains to be seen whether Oracle will formally object to the order. By doing so, Oracle could preserve its record with a view to a later appeal, but an objection only makes sense if there's a strong legal reason for which this final pretrial order would have to be deemed unfair. Oracle might prefer to accept Judge Alsup's ruling and try to seize this opportunity to have the case resolved in the reasonably near term.